offers a sneak-peak into this thin strip of wondrous Western Ghats. The tour acquaints a tourist with a laid-back spree of the state through a stroll on the captivating sandy beaches of Kovalam, blissful sojourn on the spice jungles of Thekkady and wild time at Periyar Wildlife Sanctuary. The better half of this tour is a timeless trance on the backwaters of Kumarakom & Alleppey along side the stay in the company of mesmerizing tea gardens and wishful waterfalls in Munnar. The last stage of Know Kerala Tour rests in Kochi, the Queen of the Arabian Sea, a sea port which served as a gateway for many traders from many parts of the world. Arrive Trivandrum International Airport and transfer to your hotel at Kovalam (16 kms/½ hrs.) for overnight at hotel. 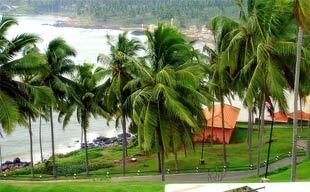 Kovalam is one of India's internationally renowned beaches, in God's own country, Kerala. Kovalam, with its sheltered natural bay, azure blue waters and a sumptuous spread of green palm groves, is a tropical paradise. Overnight at hotel in Kovalam. In the morning full day excursion to Trivandrum. The city tour of Trivandrum includes a visit to Sri Padmanabha Swamy Temple - dedicated to Lord Vishnu, is a blend of the Kerala and Dravidian styles of architecture and is known for its mural paintings and stone carvings. Kuthirarnalika Palace Museum, Napier Museum, Sri Chitra Art Galley etc. In the afternoon excursion to Neyyar Dam. Overnight at hotel. Morning proceed to Kanyakumari which is Located at the Southern most part of India. Enroute visit Padmanabha Puram Palace and Sucheendram Temple. Kanyakumari or Cape Comorin as it was formerly called, is a place at the confluence of the Indian ocean, the Bay of Bengal and the Arabian sea. The multi coloured sand is a unique feature of the beach here. Sightseeing tour includes a visit to Gandhi Memorial which is a memorial built on the spot where the urn containing Mahatma's ashes was kept for public viewing before immersions and Swami Vivekananda Rock Memorial which is a grand memorial to the great Indian Philosopher Swami Vivekananda. The sunset at Kanyakumari is a spectacle worth seeing. Drive back to Kanyakumari and check into hotel. Morning you drive to Periyar (276 kms/06 hrs. 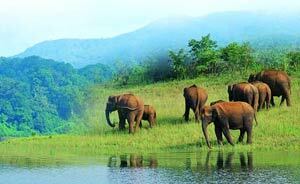 ), Periyar or Thekkady as it is commonly known, is famous as one of the best places to see the Asian Elephant. The uniqueness of this sanctuary is the Periyar Lake, an artificial lake, which was created by damming the Periyar River a century ago. Upon arrival check-in to the hotel. Rest of the day at leisure. Overnight at hotel. This morning you are collected from your hotel for Boat ride on Periyar Lake.All tourist activity is concentrated around the splendid artificial Periyar Lake, an incredible way to experience the sanctuary. There are an estimated 700 elephants roaming these forests. Most of the population is generally concentrated on the banks of the Periyar Lake and come to the lake to frolic in the water. Late in the afternoon visit a nearby Spice Plantation. The area is famous for Cardamom, Coffee and Tea plantations. Evening at leisure. Overnight at hotel. This morning you drive to Kumarakom (200 kms/04 hrs. 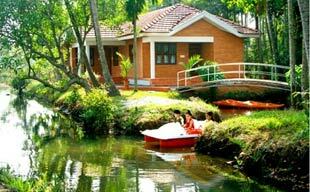 ), The enchanting backwater destination of Kumarakom is a small village that is a cluster of little islands on the Vembanad Lake in Kerala. From wandering into the depths of its wildlife sanctuary to cruising down the back waters and fishing, Kumarakom is perfect for a lazy and laid back holiday. The best way to watch the birds of the Kumarakom sanctuary is a boat trip round the islands, as hundreds of swaying verdant coconut palms lining the rivers lean to brush the tops of your heads. Kumarakom is an example of nature at her bountiful best in the fragrant flowers, the riot of multi coloured birds, the surrounding greenery and the clear waters. Upon arrival check-in to the hotel. Rest of the day at leisure to enjoy the Nature's beauty on your own. Overnight at hotel. 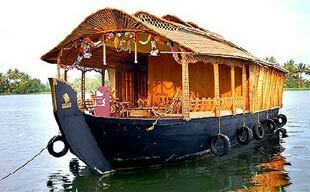 House Boat - A highlight of any Kerala tour is a night spent onboard a houseboat, or a rice barge. These converted rice barges or "Kettuvallams" sail along shallow, palm-fringed lakes and narrow canals where coconut and cashew is loaded onto dugouts. Overnight on board Houseboat. After breakfast, disembark the houseboat in Alleppey and depart for Munnar by road (150 kms / 03 hrs), Munnar is unending expanse of tea plantations and is essentially a tea town. The tea plantations have now been taken over by the Tata Tea Company. It's the place you would love to visit - it's the place you would wish never to leave. Upon arrival check-in to the hotel. Rest of the day at leisure to explore the city on your own. Overnight at hotel. Today, you could take a tour to one of Munnar's many tea gardens or Spice plantations. Overnight at hotel. This morning you drive to Cochin (135 km/03 hrs. )Cochin: - Cochin means harbour and even before the building of Ancient Rome, spices, silks, ivory and sandalwood were traded here. Cochin became the first port of call for Arabs and came to be known as the "Queen of the Arabian Sea." This city offers visitors Forts, palaces, museums, old churches, cool backwaters, palm fringed lagoons, beaches and the practicality of a contemporary metro.Upon arrival check-in to the hotel. In the evening tour includes a Kathakali dance performance at a local theatre. 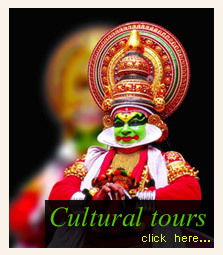 Kathakali is a traditional dance form, depicting Indian epics (Ramayana and Mahabharata). The dancers are dressed in very colorful and elaborate costumes. Their faces are painted to depict various characters of the se epics. This dance has a lot of facial expressions and brisk, yet articulate body movements. Overnight at hotel. Today the tour includes a visit to Fort Cochin a home to a unique community of Eurasians, commonly known as "Anglo-Indians". The architecture of the quiet streets in this enclave is very definitely, European with fine houses built by wealthy British traders, and Dutch cottages with split farmhouse doors. Mattancherry Palace -locally known as the Dutch Palace, the two storey building was actually erected by the Portuguese, as a gift to the Cochin Raja. 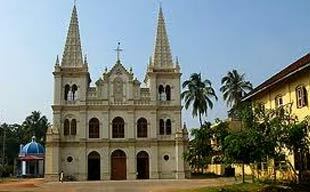 St. Francis Church - this Protestant church was originally built by the Portuguese in 1510 A.D. It is considered to be India's oldest European church. Today it is governed by the Church of South India (CSI). Vasco Da Gama was buried here before his remains were taken back to Portugal 14 years later. Jewish synagogue - dates from 1568 and is adorned with fine glass lamps and floor tiles. Afternoon at leisure. Overnight at hotel. Connect the flight from Cochin airport in time for your flight home.